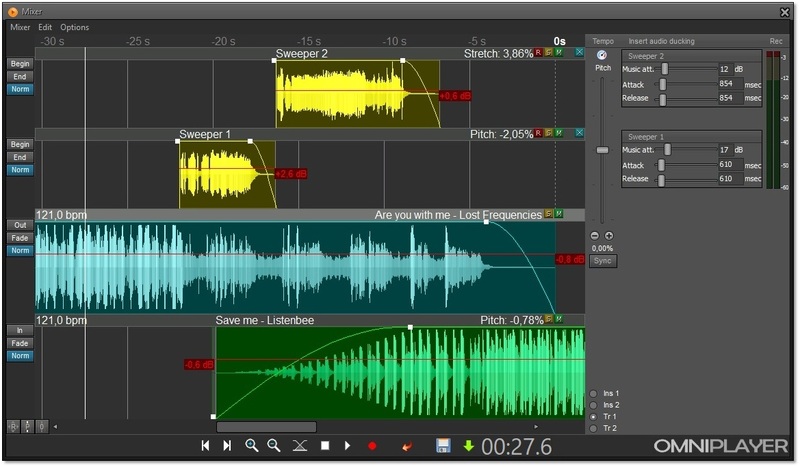 With the real time MixEditor, DJ’s can prepare audio segues between music titles as well as inserting jingles and voicetracks on segues using the multichannel waveform view. Use it to prepare a show days before or use it during your live radio broadcast. It’s also possible to set the begin- and end-offsets, volume editing and audio ducking on each track. Pitch- and stretch control including BPM sync can be applied on all tracks to get smooth transitions. Audio segues can be created one at a time as well as for a whole log. Using the automatic mix function (for any audio title that is created in the central database), it is possible to create a default mix. The automatic mix can be applied to the title, once it has been placed in the LogEditor or MultiPlayer. The look and feel of the MixEditor including the toolbar is fully customizable.